If you're lucky enough to have freezer space, most vegetables freeze quite well. Some vegetable varieties do freeze better than others, and it's almost always best to use the youngest and most tender of your crop. Here are some basic instructions, along with preparation and freezing instructions for individual vegetables. Blanching is an important step. The enzymes which cause vegetables to lose color and flavor will continue even after the vegetables are frozen. Blanching stops these enzymes. Most vegetables are blanched in boiling water, but steam works well with a few. There are exceptions; some vegetables must be fully cooked and a few can be frozen raw and unblanched. Fill a large kettle with 1 gallon of water or more; bring water to a brisk boil. Blanch no more than 1 pound of vegetables per 1 gallon of water at a time. Use a basket, strainer or cheesecloth (bundle a pound or less of vegetables in the cheesecloth) to submerge vegetables in the boiling water. If the water doesn't return to a boil in about 1 minute, use a smaller amount the next batch. Cover the pot and boil for the specified time (see individual vegetables, below) then remove quickly and submerge a large bowl or deep pot of water and ice to cool quickly and stop the cooking. When vegetables are thoroughly chilled, remove, drain and pat dry. Keep chilled in the refrigerator if they will not be packed immediately. Use a large kettle with a rack. It should hold the vegetables over about 1 1/2 to 2 inches of water. Bring the water to a boil, put vegetables in the basket in a single layer. Cover the kettle and keep the heat high for the specified amount of time. Remove to ice water immediately; chill thoroughly, drain and pat dry. Keep chilled in the refrigerator if they will not be packed immediately. You can pack the chilled vegetables right in the containers, but dry packing will help to prevent clumping and make it easier to use small amounts from containers. Arrange blanched, chilled vegetables on a baking sheet or tray in a single layer. Freeze at -20 F., or as quickly as your freezer will allow. 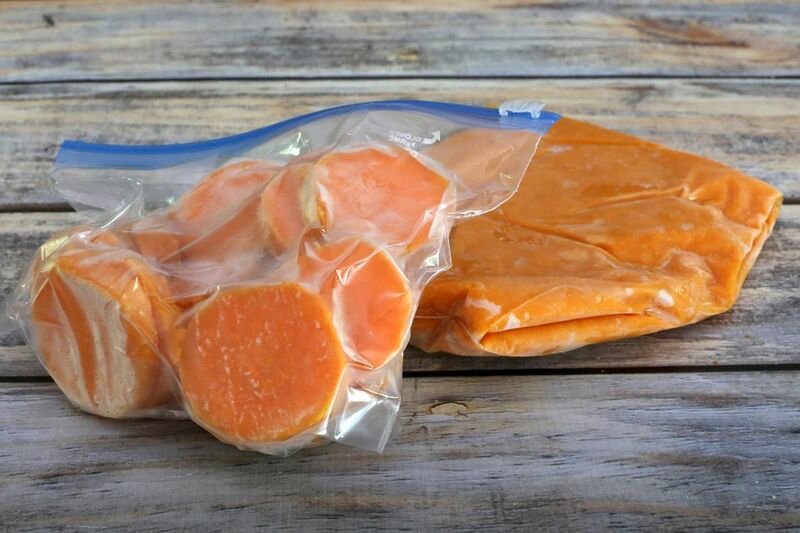 Once frozen, pack in freezer containers or bags. In general, it's best to use as little water as possible, and cook until the vegetables are done to your satisfaction. It isn't necessary to thaw frozen vegetables first, but you might want to thaw greens a bit to separate leaves. For most frozen vegetables, use 1/2 cup of water for every 2 cups of vegetables. Use 1 cup of water for every 2 cups of lima beans. Corn on the cob should be cooked with enough water to cover completely. Large lima beans, cut snap beans, broccoli, carrots, cauliflower, corn, and peas -- 3 to 10 minutes.